Plants are a great way to introduce color to your aquarium, especially bright greens. They come in lots of diverse shapes and can be planted in different areas of the tank. 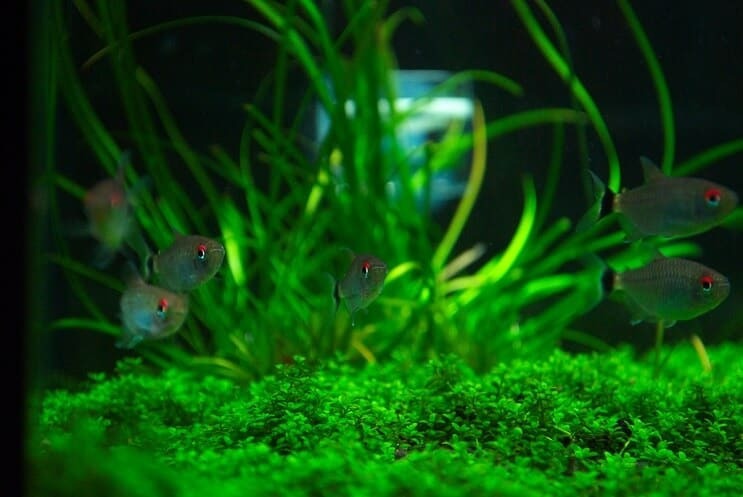 Staurogyne repens is an ideal choice for the lower levels of the tank and is great at forming carpets over the substrate. This provides extra shelter for bottom-dwelling fish while also oxygenating the water and removing nitrates. It’s one of the easiest plants to look after; it’s hardy and slow-growing so it needs very little maintenance. This makes it ideal for beginners who might struggle to care for more delicate plants. Staurogyne repens is a freshwater plant from the Acanthaceae family; this family contains around 2500 species from countries all around the world. This particular species is from the Cristalino River in South America. It’s a hardy plant that can survive a lot of mistakes made by new fishkeepers. This makes it suitable for anyone looking to add some vegetation to their tank. As with all plants, Staurogyne repens will raise the quality of your aquarium’s water, helping you to keep your tank clean. 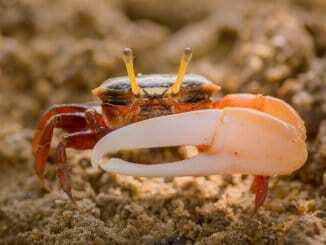 It will release oxygen as it photosynthesizes and remove some of the nitrate and toxins dissolved in the water. What sets this apart from other plants is the bright green colors and bushy appearance; it’s a popular choice in aquascaped tanks. Staurogyne repens looks similar to species in the invasive Hygrophila genus which contains South American swamp weeds, but these grow a bit taller and have larger leaves. It is a vibrant green color; much brighter than some other hardy examples like hornwort. The stems are stiff to help it hold its position in the tank. Their leaves are busy and densely packed; this means they are ideal to make a carpet over the substrate. This carpet will reach around 2-4 inches tall, so there will be plenty of open swimming space above a mature plant. The leaves themselves are a fairly classic leaf shape, an oval which is broad at the base and comes to a point at the end. Roots are thin and white. They will mostly be buried in the substrate to anchor the plant in place, but sometimes they start growing upwards (to collect nutrients from the water). Most fish stores sell a variety of plants; this species in particular is becoming more commonly sold as it grows in popularity amongst fishkeepers. Before you buy the plant, check the stems. You should check for signs of damage, as damaged plants will struggle to grow once they’re re-planted. The stems should be green or slightly brown and firm enough to support their own weight. They should be nearly fully grown (2-4 inches). It’s not very expensive as it’s easy for sellers to grow and propagate. $5-$10 will get you a good number of stems. The amount you need depends on your tank size. Only buy a few stems initially so you don’t overcrowd the tank when they grow; you can propagate these later if there’s still more space you want to cover. There’s a reason this plant isn’t found globally, or even all over Brazil. It requires very specific water conditions. If you can recreate the conditions of the Cristalino River in your tank, then your Staurogyne repens will flourish. You should keep this plant in at least a 10 gallon tank, this will give it space to grow. Other than aquarium size, the main thing to consider is lighting, water quality and substrate. The substrate is important since they’ll spend all their time rooted into it. Smaller gravels and sands make it easy for the roots to push themselves downwards. Plants need light to photosynthesize. In the wild this would be from the sun, but in captivity you need to provide a good lighting system. Most standard aquarium lights are bright enough, try to leave them on for around 10 hours a day. Also make sure to avoid natural light as this can promote algae growth. In terms of temperature, the water needs to be 68-86°F (higher temperatures are better for promoting growth). Hardness should be 3-10 KH. The pH range of 6-8 lets Staurogyne repens live in a variety of waters. It can be slightly acidic or alkaline, as long as neither of the extremes are reached. Keep the water clear to help light penetrate the lower levels of the tank. Regular water changes will help to keep the water clear. If your plant keeps growing then you know that conditions are good, but it does mean that you’ll have to trim down the stems now and again. They are generally slow-growing plants, so not particularly high maintenance. The stems can grow at different rates, so you would want to cut the faster ones back down to recreate the carpet look. You can replant some of the cuttings if you’re looking to propagate them (more on this later). There are supplements you can add into the water if some specimens are looking a little unhealthy; perhaps they are sagging or losing their color. These usually come in a liquid form and contain a cocktail of nutrients. You can also get nutrient rich substrates that gradually release nutrients to be taken up by the roots. These supplements can help to speed up plant growth too. Adding carbon dioxide to the tank also helps plants grow, but make sure you don’t add too much as this can harm your fish. If this is the first time you’re adding Staurogyne repens to the tank, don’t add too many stems. Start with just a few, then add more later when you know how much space you have left. The amount you use will depend on your tank size. You should aim for one stem for every 2-3 gallons. Remember this species forms a carpet, so you won’t be able to float it. Plant each stem just over half an inch into the sediment. This leaves space for the roots to grow while being deep enough to hold it in place. The substrate should have small grains, so the roots can grow between. If they’re planted near buried decorations or rocks, the roots may begin to attach and grow around them. This is only a problem if you want to move the decorations later on. After a few weeks the stems should start slowing in growth as they’re start to reach their full height. The roots will be entangled with other nearby stems, and possibly also growing out of the substrate. They need light so don’t put them by any towering decorations that cast a shadow over them. If you’re keeping any plants that float on the surface they will need to be in a different part of the tank. Since Staurogyne repens covers the bottom of your tank, bottom-dwelling fish are going to get the most enjoyment out of it. However, you can’t just keep it with any fish, its leaves are an easy target for an individual looking to nibble on some vegetation. Goldfish will eat a lot of plants, rainbow fish and silver dollars can become culprits too. Before you buy your fish, have a look at their feeding preferences to check if they are plant eaters. Staurogyne repens can easily survive some chewing from fish because it’s so hardy, however you want to limit this where possible. 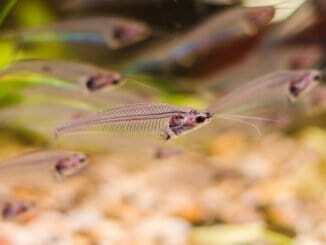 Ideal tank mates include: Danios, Tetras, Guppies, Dwarf Gourami, Bettas, Cherry Barbs, Mollies, Swordtails, Rasboras, and Corydoras Catfish. 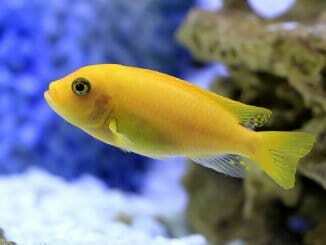 Even bigger fish such as Cichlids aren’t usually an issue. Shrimp can be added to planted tanks as well. In terms of snails you need to be careful as most species will eat a lot of plants. There are exceptions though, the assassin snail will work well with this plant. You can mix Staurogyne repens with other plants too. Most species shouldn’t cause a problem. Java fern works well if you want some taller plants in the background, or hornwort could be used as a float. The reproduction of this species is rather straightforward. In the wild, stems would start to produce side shoots that detach, fall to the substrate and develop into their own plant. Micropropagation is often used by humans to quickly generate lots of new plants in captivity. It’s quite easy for you to propagate at home too, it’s just a matter of letting it grow and cutting it. This is the same for many terrestrial plants. Leave your stems to reach 3-4 inches tall, then cut 1-2 inches off and replant it in the substrate. Over time this should develop into its own healthy plant. The cutting doesn’t need to have any roots before planting, but it will need leaves. Roots will begin to form as it grows but leaves are needed for photosynthesis. Don’t plant the cutting too deep; half an inch will do. It’s hard to find a reason that stops you adding this plant to your tank. Its hardy nature means it can be kept in a variety of water conditions and it can survive with most popular freshwater fish. It grows slowly so you don’t need to trim it too often and when you do you can use the cuttings to form new plants. It’s simple to propagate. The main thing to consider is keeping Staurogyne repens away from fish that are well known for eating plants. Otherwise this is a good choice for most aquariums, brightening up the bottom of your tank.